The wait is finally over, Jean Paul Gaultier fans – the brand new fragrance for men has launched today, and it is every bit as unreserved as you’d expect. Kokorico is described as a “a powerful, dynamic, aphrodisiac fragrance”, a scent for the confident and the charming with a blend of naturally extracted cocoa and wood notes. Far from being gourmand and overly heady, the richness is counterbalanced nicely with some green notes and a dose of fresh fig leaf. The scent is named after the cry of a rooster, a noise that Jean Paul Gaultier likens to the cry of a warrior. The energetic, explosive sound was channelled into a fragrance by Olivier Cresp and Annick Menardo, creators of Armani Attitude and DSquared2 Potion. The striking bottle design features a man’s face in profile, and when turned to the side it resembles the iconic Le Male torso. The accompanying ad campaign starring Spanish model Jon Kortajarena has been making waves, too – check out the video below to get a feel for the spirit of the scent. Jean Paul Gaultier Kokorico is available in 50ml and 100ml Eau de Toilette sprays, plus a fragranced Shower Gel, a Deodorant Stick, and an After Shave Balm. 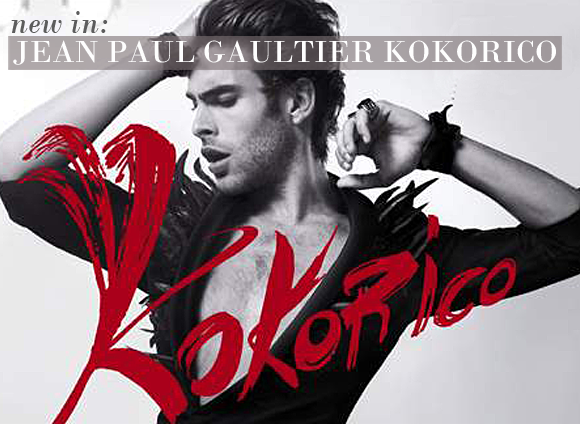 Discover Jean Paul Gaultier Kokorico right here at Escentual.com. This entry was posted on Wednesday, January 11th, 2012 at 10:29 am and is filed under Fragrance, Men, New products. You can follow any responses to this entry through the RSS 2.0 feed. You can skip to the end and leave a response. Pinging is currently not allowed.